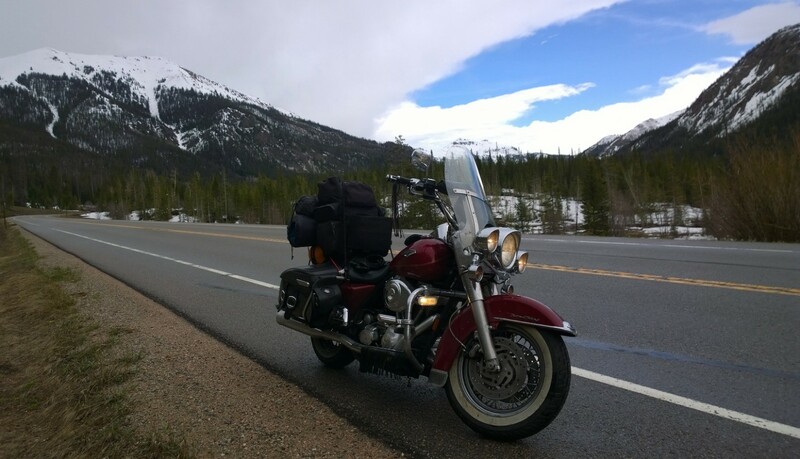 Day 16: Thunder, Lightning, Rain, Gusty Winds; 98 miles; Deadwood to Wall, South Dakota. I had a wonderful breakfast at the 1899 Inn and then rode down to Starbucks for some coffee and to write my blog. I kept looking for Nancy (see yesterday’s blog) but I didn’t spot her anywhere. As I sipped on my coffee and wrote, I noticed the sky was darkening. I checked the radar on my phone and it showed a big storm coming. I looked out the window again and the rain started pouring. Since I had nowhere to go and no time to be there I decided to wait it out. I keep realizing things while I’m on this trip. I was thinking about how I was tempted to say that it was “a bad day”, but where does that idea come from? It means I must have a mental construct of what a good day is and a bad one. Once again, where does that come from? Why do I label one day as good and another as bad? Aren’t all days equally beautiful if you don’t have any expectations? So much stress comes from expectations. We believe that things must be a certain way and get upset when they’re not. There’s certainly something beautiful in watching and feeling a thunderstorm, if we look and just accept things as they are. The temperature began dropping as well. The day before it was in the 90’s and today it had dropped to the low 60’s. After 2 hours the rain cleared and I thought I’d head out. With it being colder I decided to put on my leather jacket. The only problem was that the jacket was strapped on the bike and the outside of the jacket was soaked. It was as heavy as an anchor. I put it on anyway and then put my rain jacket on top. I didn’t get far before the rain came back, puddling the road and accompanied by a wind that looked, and felt, like it was lost and in a hurry to get somewhere. This resulted in me being blown around on the interstate, and the wind trying to steal my helmet again. What’s so special about my helmet that it’s dead set on yanking it off? I managed to ride about 98 miles and got off at Wall, South Dakota, home of the famous Wall Drug Store. I decided to find a place there. The lowest price was a Super 8. I hunkered down there, except for a brief spell at Wall Drug and the Badlands Grill and Saloon. In its own way, it was a beautiful day. ← Day 15: Billings, Montana to Deadwood; Over 5000 Trip Miles; Searching for Omens; Aces and Eights; Dropped Bike – Igor to the Rescue; My Evening on the Bench with Nancy, a Person Who is Homeless. Wall Drug is a site to see. I had to much ice cream on my visit. Stay safe!